Well, at least for the promotional photoshoot anyway! 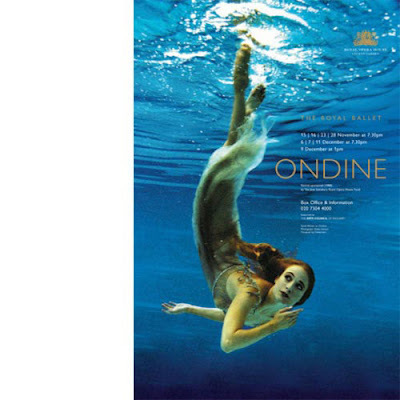 The ballet story of Ondine (or Undine) is about a water nymph (essentially a mermaid) who gives up her immortality when she falls in love with a human man. Endicott Studio watchers may remember Jane Yolen's Undine poem which beautifully illustrates the tragedy of her story. You may also be familiar with Arthur Rackham's gorgeous illustrations of which my favorite is shown at the bottom of this post. In order to capture the spirit of this character from myth the dancers went underwater in full costume to be photographed. The results are stunning and memorable as you can see for yourself. The photographer Steve Hanson is extremely gifted at photographing dancers in motion and capturing the expressiveness and vitality of the characters they're portraying. You can find his website here for a look at more of his work. Here you can also find a short behind-the-scenes video, taken by a British news station, when Steve was shooting pictures for one of the promotional posters for the Royal Ballet's new production. And here's the Rackham illustration as promised. He actually illustrated the whole of the story and it's worth taking a look at each one. Thank you to Rima for pointing the way to your magical blog! Think You Know Your Fairy Tales?